One sleepless night (it’s 4 am!!!!) and I decided to write a sequel to “Run MaxL in Workspace“. 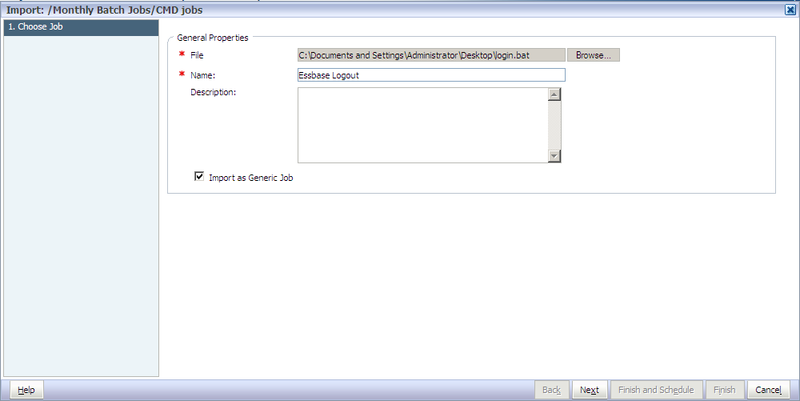 This is similar to running MaxLs in Workspace, trick is to create another generic job application. Follow the steps given below, and you can run bat files in Workspace. 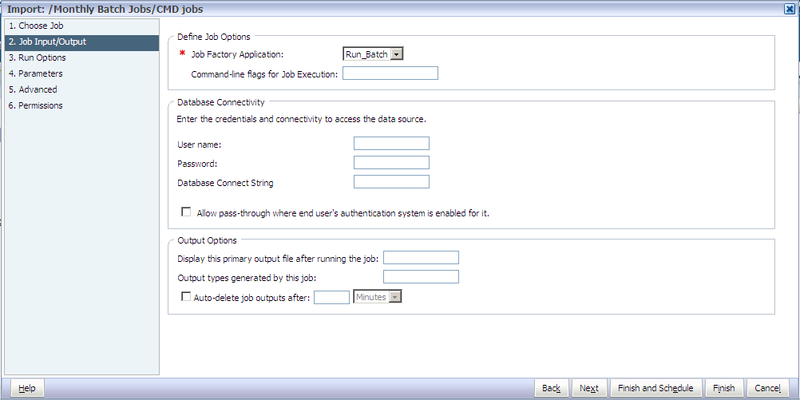 Provide a Product Name (this is the name that shows up as Job Factory Application) when importing a job. Check “Import as Generic Job” check box. Select the newly created Job Application and click Finish. I’ve MaxL files kept on Workspace server, which was executed by the bat job. This is awesome. Thanks for staying awake! Very helpful, I was striking my head to achieve this…. Thank you.. Thanks Celvin for posting the info.. one Q. can we automate the batch/schedule it to run .. from workspace…. Yes you can run it in workspace itself. you can schedule it to run at a particular time or event. fantastic stuff, but i just got to the "Running …. job" and hangs there and nothing happens. Any ideas why this is so? also tested it with a simple echo Hello to a .txt file, but did not work. Appreciate any help on this. Send me the screen shots of what you've done till now. I assume the Essbase client has to be installed on the Workspace server. Is there any way to do this if it's not? How do you point the batch script to the MaxL script you uploaded to Workspace? Is there a specific format for the path? It requires Essbase client on Workspace. If you are on 11.1.2.x you can just run EssbaseClient.exe. For earlier versions it is slightly different approach to install it. Hi ,Could you please let me know how to perform step2, since i am not able to find import option, once i compelete step1, it says ok or cancel button only. Thanks. I am new to Planning. Could you please let me know where can I find import bat file option. I mean eg navigate ->administer like that. It will be very helpful. 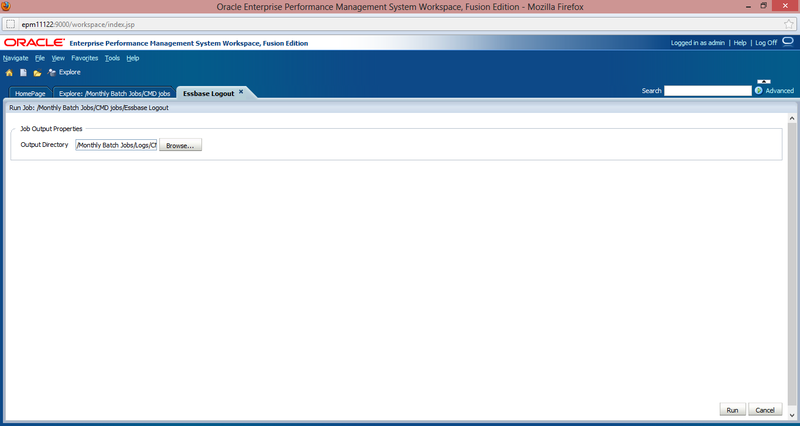 However when I run from workspace error logs are not detailed. User had still need to login to server for detailed error logs(which IT doesn't give access to users). Is there any other alternative to achieve this. Or is there any option to include email to user as an option in maxl scripting? @Venkat You can create a mailing mechanism in the bat file to mail the error logs. Or create something in the bat file which opens the error file and echo it. @KP yea it should be present on Workspace. I'm also getting the "Running …. job" and hanging problem. Checking Essbase logs/sessions shows the script commands aren't being run. Did you figure out what caused it? I can run MaxL scripts as a job in Workspace. after placing my batch files in Workspace , it works well.. excellent!!!. thanks. I have a quick question – is there a way to generate a report from Workspace to get list of jobs attached to an event. I am on version 11.1.2.2 and workspace is installed on Linux. Can I still call bat files from workspace web interface. Thanks man…was looking for help on this topic and found it Right away. Thanks Celvin for your great efforts. I want to run the batch in linux command line, not in workspace.I have question to execute it on the linux command line (by external scheduler). I did not find the schedulebatch.sh in the the bipusbin directory on my Linux server . Is that there is no such shell script in Linux? @Ahmed check for a file called ScheduleBatch (I don't think it has an extension), if it is then that's the one that you are looking for. One query : Suppose we are calling a shell script from the batch. How do you pass a parameter interactively ? Good article, but now the question is: what if I'd like to navigate the filesystem from the main batch. Let's assume making a "call" to a bat file which is not the same folder of the primary one? Is it possible? Are you running this on a *nix server. The path suggests that you are, what script are you trying to execute? Is it a bat file/she'll script? Is your workspace on windows? Is that not showing up in schedule? Great Article! – Do you know how to program an output directory so users do not have to specify a directory everytime the job is run? Hi I need to execute a batch script which runs load data command on another server. It should exist on workspace server. Did you copy the script to workspace server? Are you getting any errors? I have a question but don't know if its right place to ask but just taking my chances. In a batch script I need to copy file from workspace folders to another server.Files stored in workspace folders are stored as unique Id's in RAF folders. If you are trying to move workspace objects by copying those objects it is not going to work. Workspace stores that information in two ways it gets stored relationally and also in the RAF folders. The post is helpful. The comments are also informative. Thanks. I'm picking up. I am having a blat command inside the batch file , While running this batch file from Workspace, the email is not getting triggered. Does it work if you run the bat file from command prompt? Yes , its working when i am running the bat file from Command Prompt. Hi Celvin, in 11.1.2.4 on Solaris "ScheduleBatch.sh" is not available. I'm not sure if it is by "design". I traversed the whole file system but there is no trace of it. Financial Reporting was fully deployed an it is functional. Thanks Celvin for the tip regarding the "ScheduleBatch.sh". Actually the file resides in the "bin" directory where FRS is installed without extension as "ScheduleBatch". Just copy it to the FR server and name it as "ScheduleBatch.sh" and give it execute permission. Hi,Thank you for a wonderful post. It helped me a lot. Two things I just want to check here. 1) Can we fix the “Job Output” path while setting up the job. 2) Using Username command in script produces “$” username while running the file through workspace but if the same is run directly through batch file it will give the username correctly as required. Any setting/command/parameter we can set from our end to fetch the correct username instead of servername$. 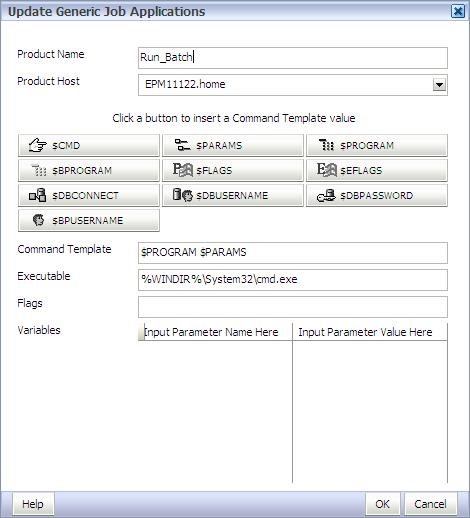 I'm Running a batch files from the Oracle EPM Workspace, I set up The parameters page for creating prompts but how can I send values to the batch files that are being called. You send the parameters when you start the job. Hi Celvin, this page has been really great help to me. One question though, if I update the batch script in its original location, the workspace job still runs the old version of the script. Any idea how to update? Do I need to reimport “File as a job” or something? Yes you’ll have to import it as a job again. I think you make that as a parameter, then it should ask for input. Also you can encrypt the maxl so that it won’t show the passwords. Thanks for sharing the Info, I have requirement to initiate the shell script from Workspace. My requirement- .PushData.sh should be triggered by User, how can I achieve it thru workspace? /Oracle/Middleware/user_projects/epmsystem1/ReportingAnalysis/data/JF1/tmp/JF1-0/C11.sh: line 2: exec: C1.bat: not found. If this is a shell script why a reference of bat file is there, you need to configure your generic job to call shell default shell can be located here “/usr/bin/sh” sometimes it could be in sbin. Check whether it is there? How did you configure your generic job? How can we run the shell script from workspace?